R. Pete Woodard Junior High School is proud to welcome you to our Internet home. Here you can learn about us and what's going on. Just check out the school calendar or the news and events page. We Roadies are always up to something good, whether it's athletics or club activities. We're also proud of our physical location in southwest sunny Arizona. The city of Yuma is known for its history and mild winter weather. Nestled against the Mexican border in the heart of the beautiful Sonoran Desert, it's no surprise that our school exhibits a rich Hispanic heritage that we're proud of. Yuma's a great place to live and go to school. We hope you will visit our website frequently. If you have questions about Woodard Junior High, check out the frequently asked questions. If your question isn't answered there, don't hesitate to contact us. You're also welcome to browse through our helpful links. Whether you are a student, parent, or interested community member, you'll find something interesting. The Woodard staff will provide an intellectually challenging curriculum in which each student will master grade level standards in a physically and emotionally safe environment. I want to welcome you to Woodard Jr. High School! Woodard is a vibrant and progressive educational institution that aims to provide a positive and inclusive environment for high quality learning and instruction. Excellent performance is not an exception but an expectation. 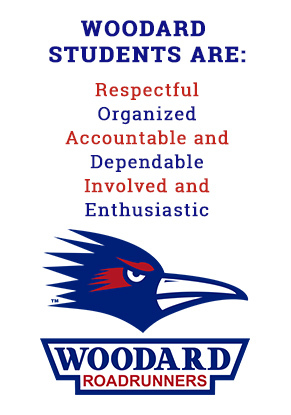 The Woodard staff is committed to providing the best possible education to every student who enters our classrooms. The staff and I do not take it lightly that you have entrusted your child’s education to us. We understand that the extraordinary success of our school is due to the hard work and dedication of our students, staff, and community. To ensure continued success, I encourage communication with your child’s teachers. For quick and easy access, our teachers' email addresses are available through our school website. We welcome your involvement in the educational process through volunteering, participating as a member of our PTO, or as an interested and invested parent/guardian. While academic excellence is the central pillar of our school, we strongly encourage students to become fully engaged in the many extra-curricular activities available to our students that extend learning beyond the classroom. Whether it means being involved in our national competing academic pentathlon team, our incredibly successful sports teams, our nationally recognized championship cheer leading team, the tremendously talented fine arts department, or joining in the various 21st century extended day clubs and opportunities. We believe in developing the whole child—academically, socially, and emotionally. I welcome you to visit us by contacting the front office to make arrangements and discover firsthand what makes Woodard Jr. High so special. Woodard Junior High loves personalized learning! Entry Bell rings: 8:30 a.m.